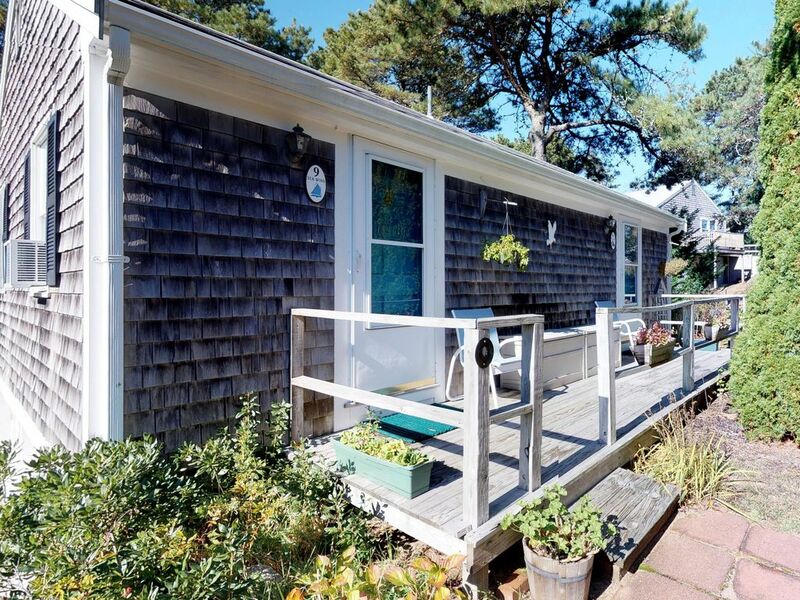 If you're looking for a cozy and quiet accommodation on Cape Cod, this cute little Orleans cottage in the pines may be the answer. Ideal for a couple interested in a romantic getaway or a small family, this rental is so close to the beach and dining, you can walk. There's also room for your water and sports equipment, so come prepared to have fun! You'll be 300 yards from Nauset Beach, which was voted Best Beach on the Lower Cape in Cape Cod Life magazine, so you can be at the sand and water within a five-minute walk for beachcombing, surfing, swimming, surf casting, or simply lounging and recharging. Rock Harbor beach offers deep sea fishing, sailing, tennis, miniature golf, galleries, and shopping, and Orleans proper boasts outstanding restaurants. In the summer, wander over to Nauset Beach for concerts, arts & craft shows, and take in a beautiful sunset or head to town and catch an Orleans Firebirds baseball game. The inside of this cute studio is efficient, offering a kitchenette with a fridge, microwave, coffeemaker, and toaster. Whip up a snack or make your morning coffee and savor it in the small back yard. At meal time, cook delicious fresh seafood dinners on the gas grill and pair your creation with some local Hog Island beer. Wind down in the evening with a movie or show on the flatscreen cable TV, which comes with a DVD player, or use the free WiFi for even more entertainment. And if the temperatures rise, the partial AC will keep you cool. Book this convenient studio today, and come enjoy Orleans and the surrounding area in comfort! Parking Notes: There is a parking area in front of Beach Rose, accessed by taking the second left off Smith Neck Road and following the driveway past the garage and around to the front of the Beach Rose Studio. Please leave room for other parked vehicles. In town for a wedding and this was a perfect place for the 2 of us. Although there is a daybed and a queen, I think it’d get a bit tight in there for 3 people. That said, you can’t beat the location! Cottage was great. Needs a little TLC but I came at the end of a very busy season. I will definitely be back! Great accommodations - had all I required for my stay!! Nice little getaway. Perfect for a couple. We had a great time on the Cape. The studio cottage was located perfectly. Close to Nauset beach, 1 min. drive. Had the opportunity to fish the early morning at Nauset beach. Caught a couple stripers and herring. Plenty of gray seals. The only con was we didn't know it was adjoined to another cottage. One building, 2 separate units. One nice addition would be a privacy partition on deck. We like to sit out there on morn in our leisure clothes w/o feeling funny. Nonetheless the neighbors were very nice. The AC was welcomed with the beautiful beach weather this week. We brought an electric frying pan for quick breakfasts. Amenities were ample. If I would suggest to the owners, a small kitchenette with a sink and single burner would make it 100%. Washing dishes and glasses in bathroom was different. If we agree to come back to Orleans which I see why not, I would put "Beach Rose" cottage and the other adjoined unit on my search list. Cozy, well equipped and best of all close to the beach! Perfect for a couple. Beautiful grounds and an excellent location withing walking distance to the beach. Well equipped with everything we needed for our stay. The queen bed was very comfortable and the daybed was great for watching tv, reading or lounging and would be comfy to sleep on, too. Bathroom could use a makeover and while you are at it, install a small sink in the kitchenette. This is why I rated it 4 stars instead of 5 but I would definitely return to the Beach Rose or the adjacent property, the Sea Wind. I'm new to Cape Cod vacations but hard to imagine coming across a greater place for a family get away. Orleans has so much to offer. The cottage was exactly as advertised. Really cozy and clean. And in an amazing location. Walking to Nauset Beach was great. Would love to make the stay again!